Ball end magnetorheological finishing is a recently developed nanofinishing process suitable for finishing of complex three-dimensional surfaces. This process makes use of magnetically stiffened ball-shaped tool of abrasive-mixed magnetorheological fluid that is known as magnetorheological polishing (MRP) fluid. The stiffness of the ball-shaped MRP fluid can be precisely controlled for the gentle finishing action, which is the prime requirement for the finishing of soft materials such as copper. Due to the nonmagnetic nature of the copper, the magnetic field is not enough to provide sufficient finishing forces in ball end magnetorheological finishing (BEMRF) process. In the present study, finishing forces have been analyzed for carbonyl iron particles (CIPs) and electrolytic iron powder (EIP)-based fluids. It is observed that electrolytic iron powder-based fluid exerts higher normal force during the finishing. A permanent magnet with the opposite pole facing the tool tip can enhance the finishing forces up to an appreciable extent to finish the copper workpiece significantly. The composition of MRP fluid depends on the material to be polished. The effects of fluid composition parameters on surface finish have been studied, and it is observed that abrasive mesh size is the most important fluid parameter in BEMRF of copper followed by iron powder and abrasive concentrations. Optimum fluid composition is suggested for ball end MR finishing of copper, and sample finished using optimum fluid composition is analyzed using surface analyzer and scanning electron microscopy. 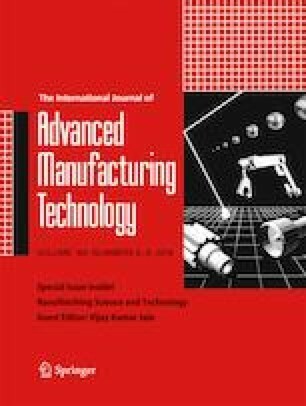 This paper is a revised and expanded version of the paper entitled “Selection of optimum polishing fluid composition for ball end magnetorheological finishing (BEMRF) of copper” presented at 6th International and 27th All India Manufacturing, Technology, Design, and Research Conference (AIMTDR 2016), Pune, December 16–18, 2016. We sincerely thank speedfam India Pvt. Ltd. for providing the polishing grade abrasives. We also thank Central Research Facility (CRF) IIT Delhi to facilitate the sharing of resources.